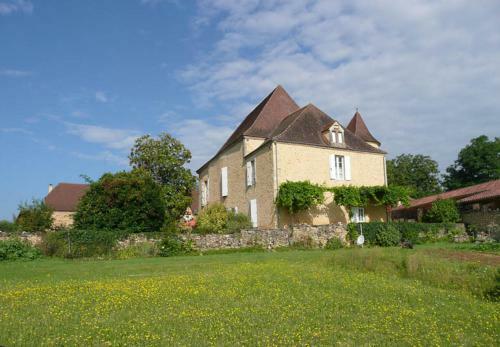 The Manor de Bigaroque is an authentic castle of the XVth, transformed into a pleasant manor house over the centuries. 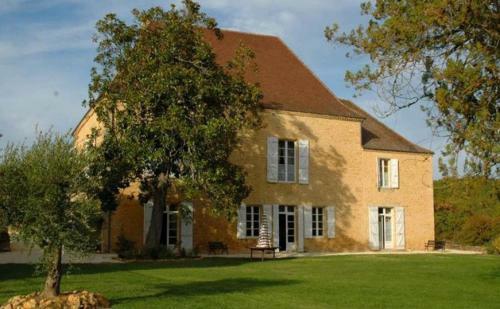 With its two superb guests houses, it offers an exceptional accomodation for up to 28 guests. The Manor de Bigaroque is an authentic castle of the XVth, transformed into a pleasant manor house over the centuries and renovated by keeping all the architectural elements which make its value. 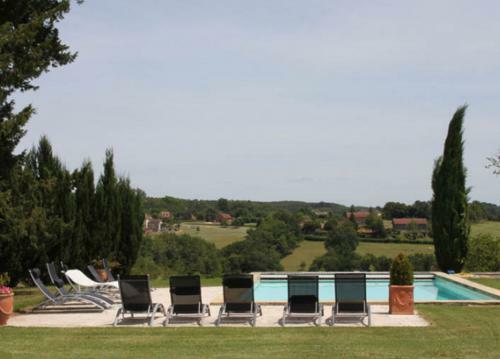 Surrounded with a 7,5 acres park, which welcomes a huge private heated swimming pool, the manor of La Brunie dominates a vast and peaceful panorama on the surrounding countryside and the valley of the river Dordogne. Its two adjacent guests house, Coux Guests House (3 bedrooms/2 bathrooms) and Bigaroque Guests House (3 bedrooms/2 bathrooms) offers another 14 sleeps in total. * a beautiful entrance hall. * a spacious and bright music living room, with a piano, sofas, armchairs, coffee table, antics, and two large french windows leading to the park. * adjacent, the TV sitting room offers also sofas, armchairs, TV and DVD Player and another french windows to access the garden. * the large formal dining area is a testament to the history of the Manor, with its majestic stone fireplace and massive wooden table and chairs. 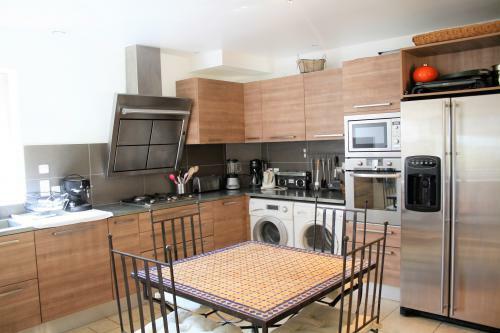 * the good size kitchen is idealy equiped to cook the delicious local products. 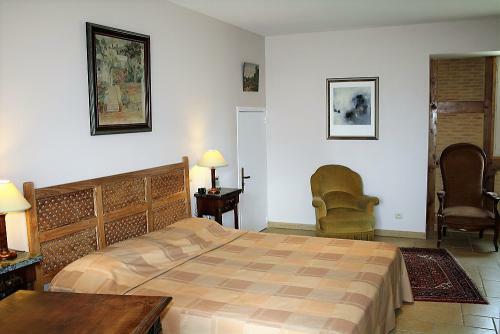 * The first spacious bedroom offers a 1,60m double bed, a cot, and direct access to the garden. 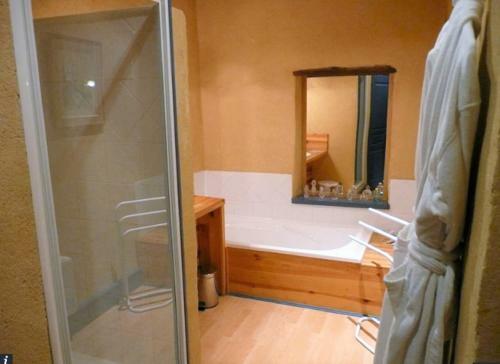 it enjoys its ensuite shower room with a shower unit, a washbasin, and separate toilet. * a laundry room is available at that level. From the entrance, the spiral staircases, leads to the first floor where are set 6 spacious and nicely decorated bedrooms, that invite you to pursue your historic dreams. All rooms are equipped with its own ensuite bathroom and independent toilets. 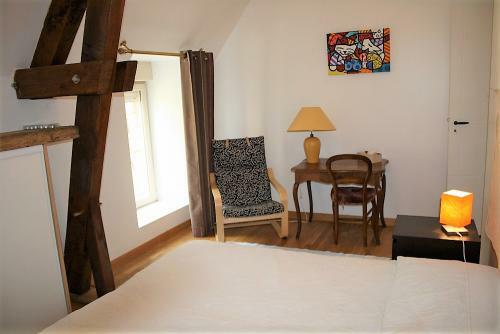 * The Castelnaud suite is a family suite comprising a double bedroom of 22sqm with a double bed of 1.60m and a view on the park and a room of 16sqm with 2 beds of 0.90 m. They share a bathroom with a bathtub and an independent shower, plus separate toilet. * The Commarque bedroom: A room of 36sqm with a double bed of 1.60m and view over the park, a bathroom with independent bathtub and shower and a separate toilet. 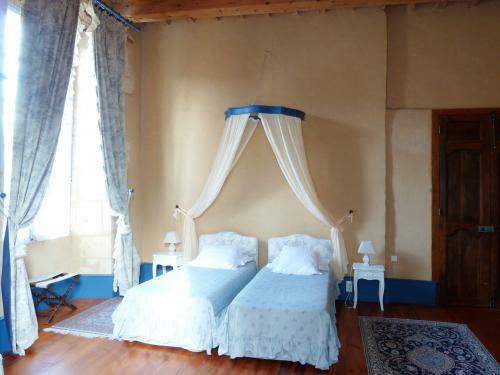 * The Fayrac bedroom: A room of 35sqm with a double bed of 1.60m or two beds of 80 cm and a view on the park, a bathroom with independent bathtub and shower and separate toilet. 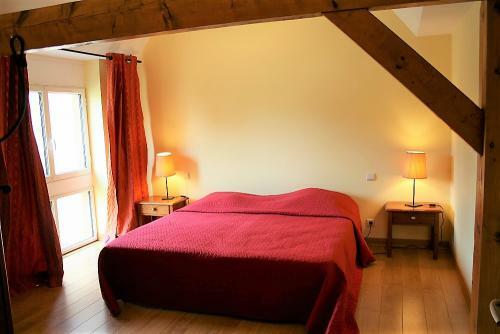 * The Puymartin bedroom: A room of 27sqm with a double bed of 1.60m or two beds of 0,80m, a bathroom with independent bathtub and shower and a separate toilet. 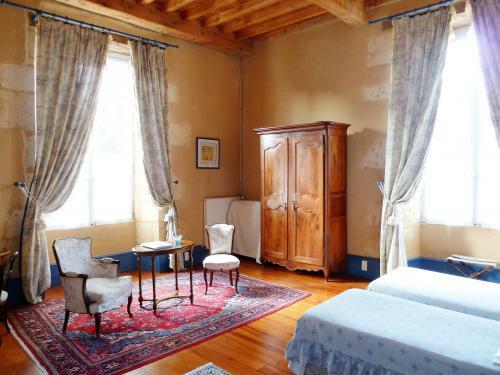 * The Beynac bedroom: A room of 17sqm with a double bed of 1.40m, a dressing, a bathroom with a shower, a separate toilet. 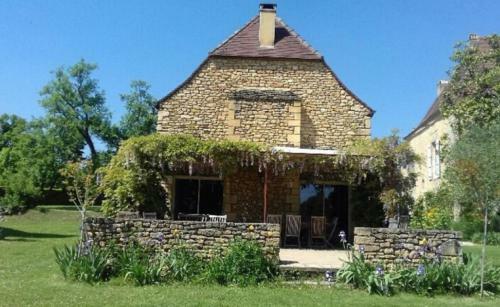 This magnificent stone barn conversion, dating from the 18th century, offers char and high quality accomodation for 6 to 8 guests. 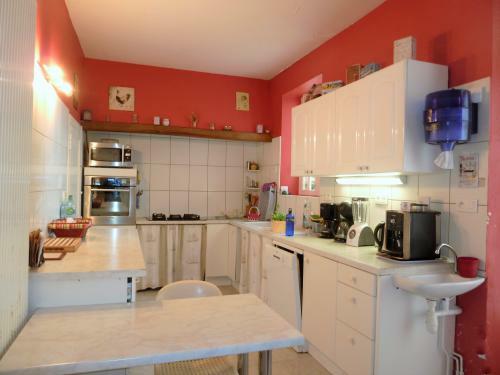 * a large fully equipped kitchen (american fridge, oven, microwave, dishwasher....) with a breakfast area. 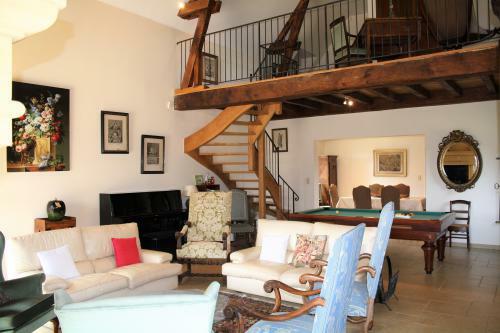 * a magnificent lounge, with stone walls, exposed beams, and high ceilings. The sofas and armchairs are grouped around the majestic stone fireplace, ideal for cooler mid season evenings; and the american billiard table offers an opportunity for relaxing entertainment! The two large glass doors lead onto the private terrace, allowing easy access for outdoor dining in summer. * the big ground floor bedroom is ideal for people with reduced mobility. It has two single beds which can be joined together to make a large double bed, a desk and two armchairs. * From the lounge, a wide wooden staircase leads to the mezzanine, furnished as a relaxing area with two armchairs, a flat screen TV and a desk. A sofa bed offers further possible sleeping accomodation for two extra guests. * The third bedroom also has two single beds, also having the possibility of joining them together if necessary, a cupboard, a desk and an armchair. 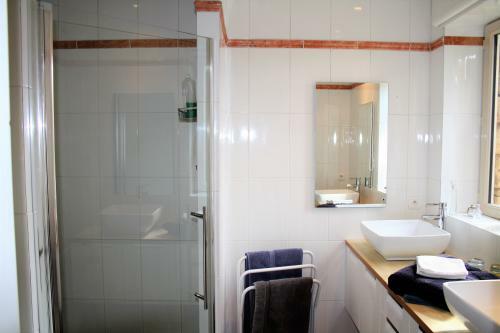 * These two bedrooms share a shower room with washbasin and multi jet shower. Outside, LeCoux GuestHouse enjoys a private paved terrace with table and chairs, covered by a pergola, and wooden sun loungers. 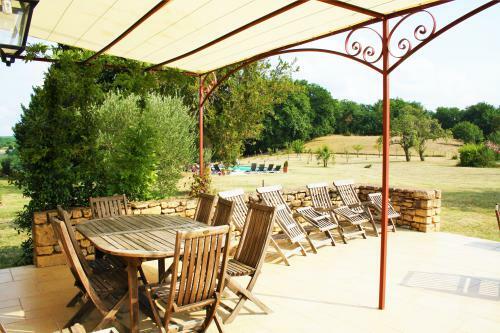 This former tabacco drying barn of 200sqm offers quality and charming accomodation for up to 8 guests. * magnificent entrance hall with stone walls, exposed beams, and high ceilings. - the "book lounge", where sofas and armchairs are grouped around the majestic stone fireplace, ideal for cooler mid season evenings. The large selection of french and english books and magazines offers an opportunity for relaxing entertainment. - the TV lounge, set on the mezzanine level, also equipped with a comfortable sofa. 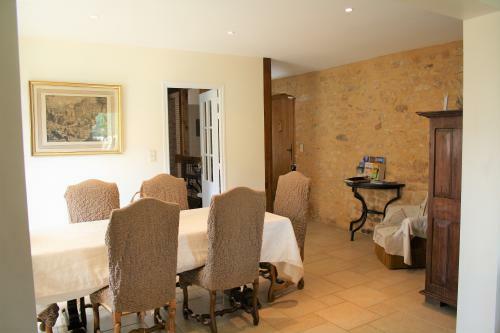 * a superb dining room with solid wooden dining table and 8 chairs. Its two large glass doors lead onto the private terrace, allowing easy access for outdoor dining in summer. * a large ground floor bedroom, ideal for people with reduced mobility. It has two single beds (90cm large) which can be joined together to make a double bed, storage area and two armchairs. * another separate toilet completes the ground floor. 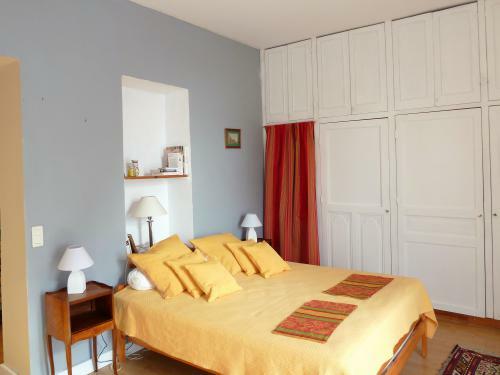 * a second bedroom with two single beds, each 100cm large, which can be put together to make a 200cm large double bed, a cupboard and two seats. * a third bedroom also with two beds (90cm) which can be joined together to make a double, a wooden wardrobe, a folding screen and two seats. - A third terrace, also equiped with table and chairs, is available at the rear side of the house. 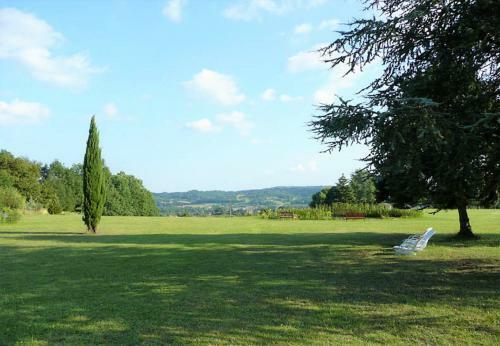 * A wonderful landscaped garden of 3 hectares, planted with pine, willow and walnut trees, offering a panoramic view over the surrounding countryside. 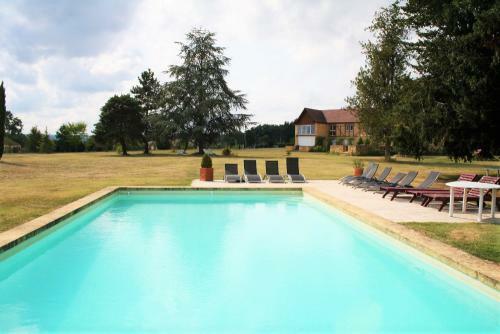 * the large private pool, measuring 12m x 6m (depth from 1.2m to 2m), is heated from May to Septembre and secured by an electric cover. There are sun loungers and parasols. 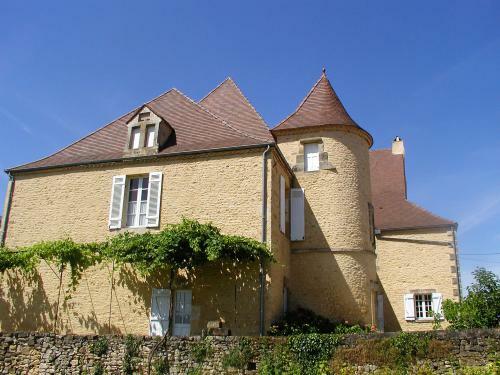 The Manor of Bigaroque is ideally located in the "golden triangle" of the Black Périgord, thus near the main places of interest to be visited, between the prehistory and the history: close to famous caves (Lascaux, Rouffignac, Eyzies), the castles of Beynac, Milandes, Castelnaud and of the medieval city of Sarlat. During high season the changeover day is saturday; flexible the rest of the year.